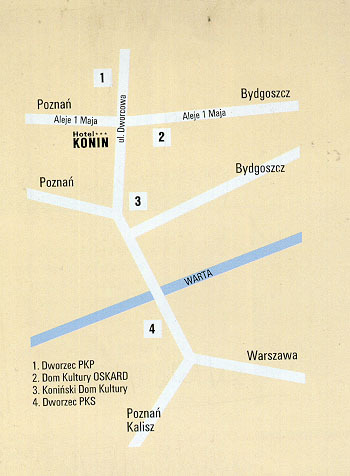 The Konin hotel is situated in the city centre, 300 meters away from the main railway station. The main bus station is 2 km away. The hotel is found in the neighbourhood of shopping services, community houses, cinemas and night clubs. We offer single, double rooms and two double suites. Each room is equipped with a bathroom and a telephone (overseas connections). The interiors are aesthetic and practical, giving our guests maximum comfort and privacy. At guests disposal in the hotel there is a currency exchange office , a hairdresser and a fitness centre. In our restaurant delicious meals of traditional Polish and international cuisine are served. There is a car park nearby the hotel. You can get to the hotel by using busline no. : 50, 52, 54, 57, 58 from the main bus station.